« DATING: Be Creative Guys! Her husband’s nose is now on a man with brown eyes and dark hair. And it really is Joseph’s nose on Maki. Although I live in Boston and have been going to doctors at Brigham and Women’s Hospital for more than a decade, I learned of the facial transplant story by watching the documentary BostonMed last summer. When I heard that Susan Whitman Helfgot [with William Novak] wrote a book about it, I immediately had to read it. 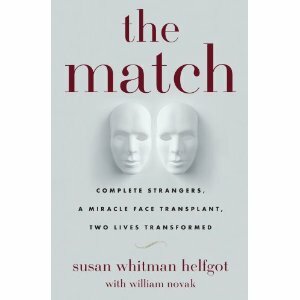 The Match is a book that is several things rolled into one: the story of organ donation and the transplant process; a great love story; and a story of hope and renewal. Susan Helfgot writes the compelling story of the last kind act her husband made that will forever affect Maki and his family. The same age, both men led vastly different lives. Biographical elements weave in between hospital scenes. The Match delves into both men’s pasts and creates vivid portraits for the reader. Joseph Helfgot was a sociology professor at Boston University when he met Susan. A convivial man, he developed a successful music marketing business in Los Angeles. The son of Holocaust survivors, Joseph had a keen work ethic and a zest for magical moments whether at a Hollywood screening, having rooftop dinners with his wife or spending Passover with his family. On the other hand, James Maki is a Vietnam veteran and former drug-addict. A horrific accident—a fall onto the electrical third track at an MBTA subway station—left him without a face and with little hope to change his life and improve his relationship with his college-aged daughter. The hand surgeons have started attaching the sentinel flap. While they work, Pomahac and Pribaz begin to connect nerves on either side of Maki’s face, using a technique known as neurorrhaphy. It is painfully slow going as the doctors knit together Helfgot’s and Maki’s tiny nerves, one suture at a time. Nerves near the surface will provide sensation, allowing Maki to feel steam rising from a cup of hot coffee or a light breeze on a warm day. Other nerves, sutured deeper in the face, will one day allow him to chew and swallow. They are piecing together a kind of 3-D jigsaw puzzle, one tiny segment at a time. The Match includes a detailed description of the exhaustive, intense and amazing surgery. A world-renowned teaching and research hospital, Brigham and Women’s Hospital is home to the finest surgical team of varied specialists led by Dr. Bo Pomahac, director of Brigham and Women’s Burn Center; and Dr. Julian Pribaz, director of the Harvard Plastic Surgery Resident Program. The team completes the second face transplant in the United States [this leads to a huge Department of Defense grant to Brigham and Women’s Hospital for more surgeries]. Personally, I have been to see Dr. Pribaz [for exploratory hand surgery on an edema], a supremely kind, talented plastic surgeon who travels the world reconstructing noses and other body parts. Reinforcing the importance of organ donation through the story of two men who never meet but whose lives intersect in a remarkable manner, The Match is a vastly informative and engulfing read. This entry was posted on November 9, 2010, 19:53 and is filed under Books. You can follow any responses to this entry through RSS 2.0. Both comments and pings are currently closed.